Whispering Soul Streams: angels anyone? Who are the angels in your life? Those special people who make your spirit soar just at the thought of them? Who inspire you by the way they've chosen to view the world, the obstacles they've courageously pushed through, the choices they've made to create a world of beautiful in the midst of ugly? 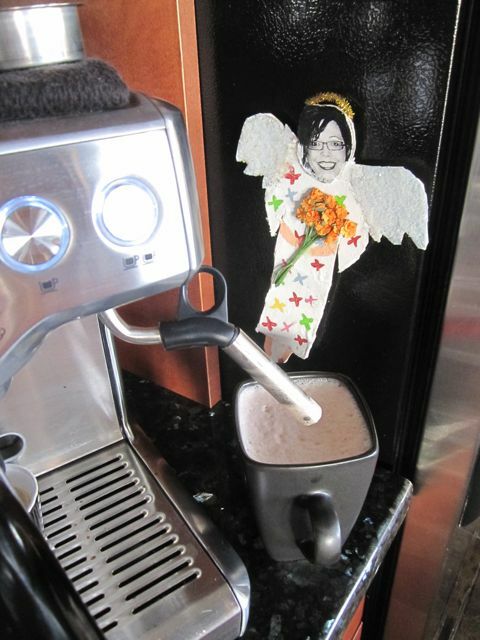 This particular angel of mine sits perched next to the spot where I make coffee every morning --reminding me of what an amazing person I have been blessed to know. No wonder her students presented her to the world in this particular piece of angelic artwork. We met back in university while studying for our education degrees. I recently found a letter she'd written me all those years ago that broke my heart again.....the way her questions go right to the heart of painful topics with honesty, courage and a forthrightness that is remarkable. Truly! She has taught me so much about childlike trust in God, courage in the face of evil, strength in weakness, and grace that meets all of us right where we are. I just wanted to take a moment to say a special "thank you." Words are not adequate.....you will always be one of my most treasured REAL LIFE HEROES. Thank you, Thank you, Thank you for your immense courage, hope, sunshine and beauty. For anyone else reading, I invite you to take a quick moment and send some love to an angel in your life today.